Spin to win Raging Rhino Slots today! There are over 4,000 wicked ways to win, bonus features, special symbols and more. It's based in an African safari so you can take in the beautiful scenery as you spin. 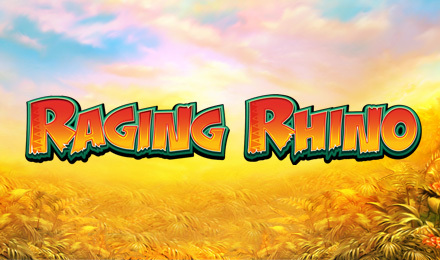 Get ready to go on an African safari when you play Raging Rhino Slots at Wicked Jackpots. There are 6 reels and an incredible 4,096 ways to win! You can win some serious cash with Scatter and Wild symbols, FREE spins and more. The reels are full of safari animals including alligators, gorillas, cheetahs, and of course rhinos. The Serengeti Tree represents the Wild. It can replace other symbols and can multiply your Wild wins by 3! Your Scatter is the Diamond, and if 6 appear on the reels, you'll get you 50 FREE spins!